Great Crested newts are usually bright-colored semi aquatic amphibians. They are the largest of the three Newt species indigenous to Britain. They are the most threatened newts in Britain. These amphibians are also known as Northern Crested Newt or Warty Newt. 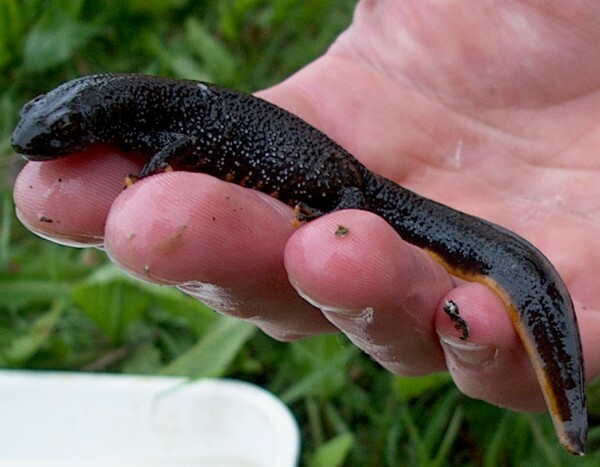 The Great Crested Newt is comparatively larger and heavier than other newts. Size: Their size ranges around 15 to 18 cm. Throat: Throat of this creature is heavily mottled with dark pigments. Toes: Their toes are strikingly marked, with black and orange stripes. It is brighter in males than females. Color: Their color ranges between dark brown and black. Their underside is bright orange with black spots. The sides are dappled with small white dots. Texture: Their skin is warty and rough. Their skin texture is granular. Tail: They have a tiny filament at the end of the tail. There is a yellow-orange stripe on the lower edge of the females’ tails. Their tail is short with well developed fins without any sharp pointed tip. 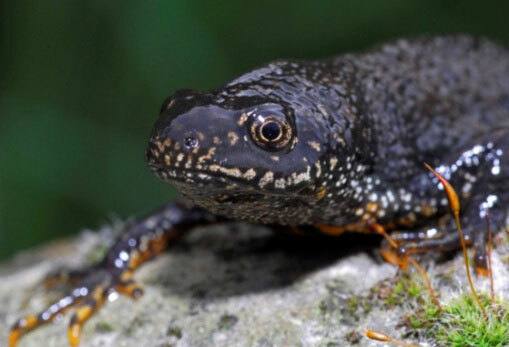 The Great Crested Newt is widely distributed throughout Britain, Scotland and Wales. 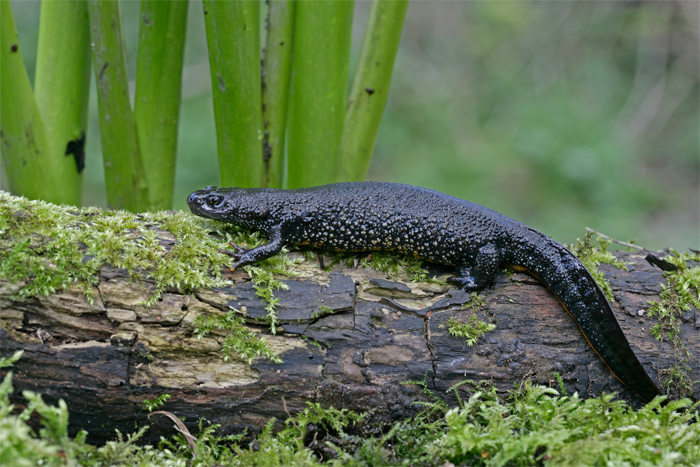 Britain is home to the largest known populations of the Great Crested Newts in the world. They are pre-dominantly found in Northern Europe, from France in the west to the Urals in the east. 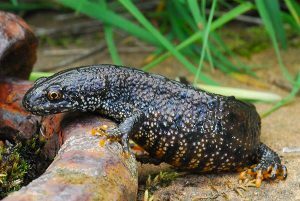 The Great Crested Newt is found in lowland habitats. It is found in large sized ponds, typically on farmlands. They need plenty of ground covered area to search food, shelter and hibernation. This usually takes the form of undisturbed rough grassland, scrub or woodland. Great Crested Newts are carnivorous. They eat mollusks, leeches and other invertebrates. They at times feed on larvae of other species. Algae, protozoa, small worms and arthropods are also eaten by these Newts. These amphibians have some interesting behavior patterns. They migrate from one place to another. Great Crested Newts are nocturnal. Male newts display and incite females. Newts often hide under objects left lying on the ground. They are largely terrestrial but breed in ponds and pools. These newts hide throughout the day and hunt for food on wet or damp evenings. Great Crested Newts are preyed upon by Grass Snakes, Moorhens and Mallards. They are also eaten by Kingfishers and Herons. Their larvae are eaten by fishes. The Great Crested Newts have certain adaptations which aids in their survival. They camouflage to save themselves from enemies. They typically curl themselves around objects and pretend to be dead. Adult newts are somewhat toxic. They give off a white substance to prevent themselves from being attacked by their predators. They are cold blooded creatures. These species of Newts can re-grow their body part if necessary. Under water they absorb some oxygen to breathe but they need to rise to the surface to take gulps of air regularly. Under water, Great Crested Newt breathes with the help of its skin which is their special adaptive feature. Males gather in open water to profess their love and attract females. They tend to be quite possessive and also protect their mates from other males. The Great Crested Newts develops sexual maturity after they reach their second or third mating season. After performing the courtship display, the males drop a small packet of germ cells in the path of the female. The male then moves sideways in front of her to gently encourage her in a position where the germ cells will be pressed against and picked up by her reproductive organs. The female lays two or three eggs a day between March and July. Till the end of July there are approximately 200 to 300 eggs. 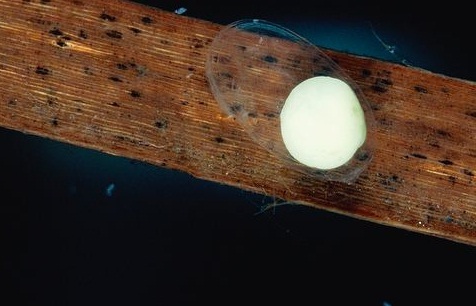 The eggs are laid on submerged aquatic plants, each carefully wrapped in a leaf. Great Crested Newts utilizes wide variety of water bodies for breeding. They breed in large, deep and clear semi permanent ponds with fair amount of vegetation and exposure to sunlight. The eggs develop within 1.5 to 3 weeks. When the baby newts are hatched it looks like a tiny adult and has gills and fins on its tail. At times these newts, frogs and toads share the same hibernation place. These newts hibernate in the winter in fissures deep under the soil or under stone walls and houses where they will not get frozen. Grown up newts leave the pond and take shelter under logs or stones during the day, so that they do not tend to dry up. They need plenty of ground cover for hibernation. From the month of October till March, these large sized newts lie dormant under logs and stones. They hibernate in the mud at the bottom of the pond where they breed. Great Crested Newts usually live up to 10 years. These newts are included in the “Least Concern” category by the IUCN. But they are threatened in Britain and so legal actions have been taken to save them from extinction. They are protected by the British and European Jurisdiction. Sum up some of the most interesting facts about these amazing amphibians. Some Great Crested Newts can live up to 27 years. Male Crested Newts can be distinguished from females by the presence of a jagged crest that runs along their back. These species of newts are excessively greedy and gobble whatever they hunt. People at times are perplexed with Great Crested Newt and the Smooth Newt. The confusion arises because the male Smooth newts develop a crest in the breeding season which is similar to Great Crested Newt. Initially the newts have gills but gradually as they grow with age, they lose their gills and grow lungs. Here are some of the amazing pictures of the Great Crested Newts. Take a close look at them.